It has been made popular by the famous manga character, Doraemon. Here is a simple recipe that will please children and adults alike! 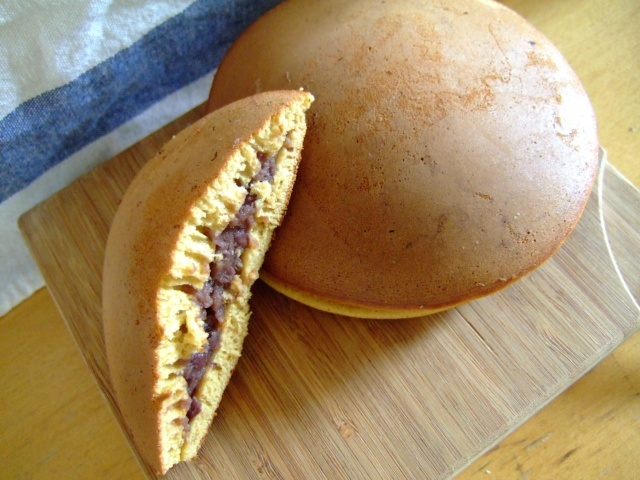 300 g: (50 g per dorayaki)Look HERE for basic recipe! -Use a hand whisker instead of an electric whisker/blender as overmixing will achieve poor results! Respect the order of the ingredients! Beat the eggs and add the sugar. Mix until the mixture whitens. Add the honey and mix until it has completely nblended in. Add bicarbonate sodium and mix. -Add half of flour and mix well. Add other half and mix well. -Add water and mix. The amount of water might vary with the kind of flour. -Heat a frypan over a medium fire first. Once the frypan has cooled down bring over the fire again. Wipe it with a kitchen paper soaked with salad oil. Wipe off excess oil if necessary. -Pour pancake mixture. Bear in mind that the size of the panckes must be the same. The amount, whatever it is must be the same. Choose your ladle/spoon well beforehand! -When bubbles have appeared across the surface turn the pancake over. -The very minimum of oil will garantee an even cooking! -Too much oil and your pancake will have that look! 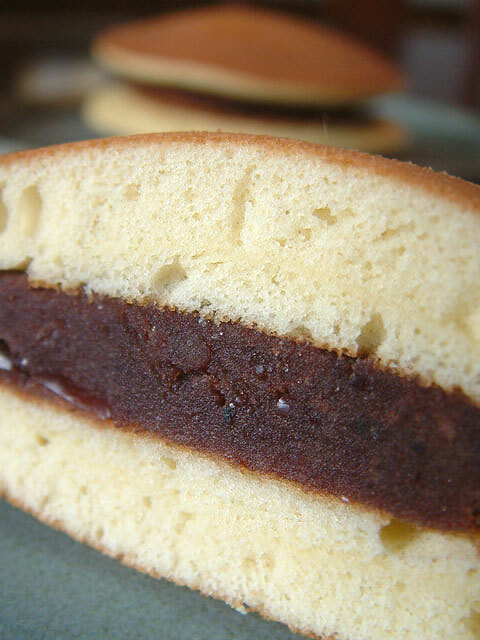 Sandwich sweetmeats/anko between two pancakes and serve hot. Once cooled down you may deep-freeze them wrapped in cellophane paper. Same directions as above. Really great texture and taste, i did reduce sugar a bit. I will make again. My daughter loves these! Thank you so much for this recipe and instructions; I made these today using gluten free flour and I had to fiddle around with the quantities a bit but eventually got the consistency right! GF versions of most things are often a little different (tosay the least!) and I expect a Japanese person would find my version unacceptable but we really enjoyed them; this recipe is so much better than the typical drop pancake recipe I find most westerners use which is dry. One thing though; surely there should be soy or tamari sauce in the ingredients? I added a teaspoon and also some Mirrin and it made the dorayaki taste divine! Well done, my friend! There is no soy or tamari sauce involved though as this is exclusively a dessert in Japan! Tough question as this is a pancake! I don’t know if they make them in India but department stores selling Japanese products might have them! Better make them yourself!